Welcome to Jaycee Park West in Oregon, WI! By year 2030 there is expected to be 50% more students in the Village of Oregon – we are in need of a sports park facility our community can be proud of. 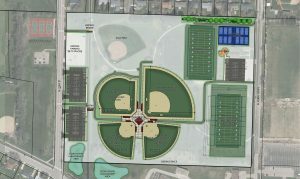 Help us create a sports park for the Oregon, WI community to enjoy soccer, rugby, lacrosse, girls softball, and boys baseball. Our goal is to provide the opportunity to participate in recreational sports and activities without traveling outside the Oregon community, focusing on improving youth sports participation, bringing business into Oregon, and creating a facility to promote fitness and wellness for all. Join us in raising funds to provide an updated facility that will showcase the Oregon community to both local and visiting sports teams. Each fundraising item sold will be matched by the Village of Oregon! All fundraising items may be picked up during business hours at the Oregon Chamber of Commerce, 2nd Floor, 117 Spring St, Oregon, WI. Items may not always be in stock due to manufacturing minimums. You will receive an e-mail notification when your order is ready for pickup.Thank you for your patience. Please contact the Chamber at 608-835-3697 or email us at jcparkwestproject@gmail.com for more information. Visit our Facebook page for updated information and fundraising events.